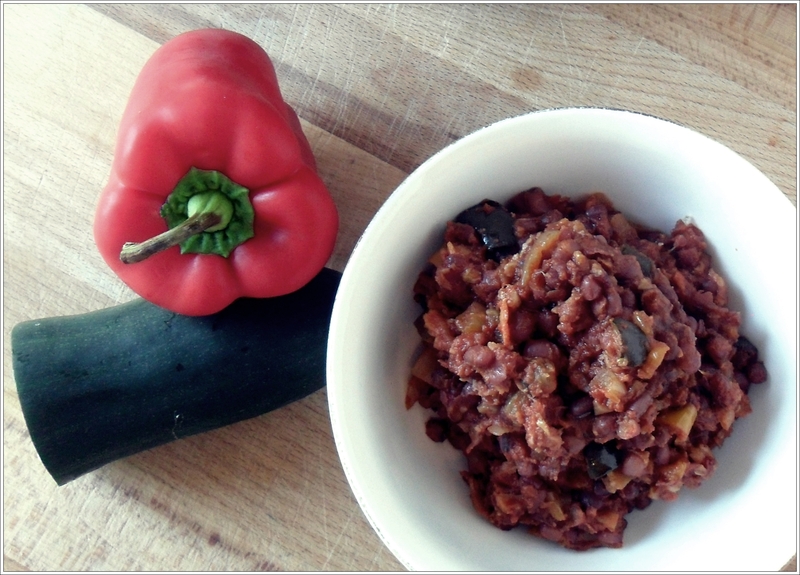 This is a bean dish that I make when I want something filling, very tasty and hearty. I’m also struggling with adding enough beans and pulses to my diet so this is certainly a way to do it, as you will get around ¼ cup of these delicious adzuki beans per portion. I make this recipe in a slow cooker, but I am sure you can adapt it to stove top cooking. My dear friend who is American told me about the miracle of slow cooker some years ago, I ordered a basic one then and never looked back. Set your slow-cooker on the countertop and put it on the high setting. Chop up onion and garlic and add to the pot. In the meantime, take your soaked adzuki beans and start cooking them in a small pot of water for 15 minutes while you are chopping the rest of the ingredients. Dice the bacon slices into 1cm pieces, cube pepper and courgette and add all of those to the slow cooker as well. While the beans are still boiling on high, add the ketchup, soy sauce, cayenne pepper and tomato puree to the bacon and vegetable medley and stir until blended. Drain the beans and add them to the slow cooker. Add salt to taste, remembering that you have already added salty soy sauce, close the lid and cook on high for 4 to 5 hours. I like this dish because as much as the ingredients and flavours are well blended when it’s ready, there is still a nice, slight bite to the beans. This amount serves 4, I serve it with a slice of bread. Enjoy! And I know you will!